Children are the future citizens of the country. The future of the country depends upon the present children. If the children do not develop in a proper way, the country's future will be ruined. This was rightly realised by our late Prime Minister Jawaharlal Nehru. So, he advised the people to stop observing his birthday on the 14th November and to observe this day as the Children's Day. Since 1956 the, 14th November is every year observed in India as the Children's Day. On the Children's Day the neglecting people will get an opportunity to think of the future of their children. The whole society will think of its duty and responsibility towards the children. They will think of what have been done for the children in the year past and what should be done for them in the year coming. Because children are the future citizens of the country and the future of the country depends upon the present children. People will know that every individual in our society has a sacred duty towards the children. 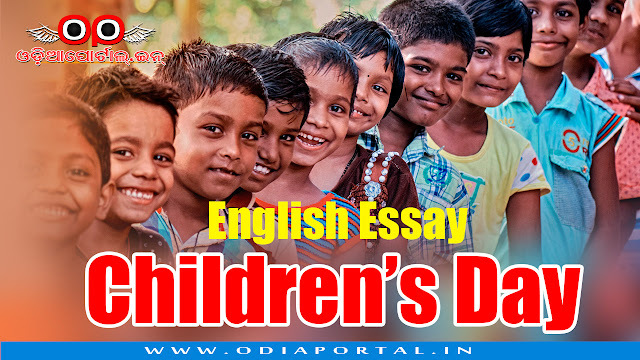 Every year on the 14th November the Children's Day is observed everywhere in our Country. People gather in meetings to discuss over the future of the children. They discuss about how to make the child healthy physically, mentally and morally. because if the students be not properly built, the future of the country will be in ruin. So, they take Pledge not to neglect their children. The Children's Day makes them realize that child is the father of man. On the Children's Day, the children are given new garments and rich food. They are given picture books. Children are the future of our Country. They are the future of our nation. So, evey individual should realize the importance of the Children's Day.